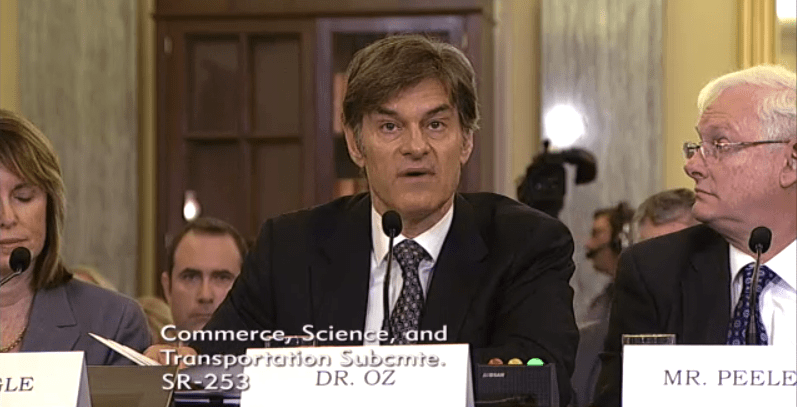 Oprah’s favorite alternative medicine mouthpiece Dr. Oz got little love during Tuesday’s Senate subcommittee hearing on the misleading marketing of diet products, with the TV personality admitting that his use of terms like “miracle” for unproven treatments had provided fodder to scammers out to make a quick buck off people desperate to shed pounds. Last night, the Doc went on Facebook to give his fans his perspective on the issue. “For years I felt that because I did not sell any products that I could be enthusiastic in my coverage,” wrote Doc Oz, who was chastised — most notably by Missouri Senator Clair McCaskill — for shows where he called certain weight-loss products “the number one miracle in a bottle” or “the magic weight-loss solution for every body type,” in spite of little to no peer-reviewed scientific evidence to back up such claims. A good chunk of the population wants to be believe there are easy solutions to medical problems being kept from them by evil drug and food companies. The primary solution to fat gain issues — cutting back on carbs — doesn’t require purchase of a magic substance and so can’t be marketed as profitably. Having been partially protected by the FDA from some quack medical claims, the population is far less skeptical than it should be. “How could they say that if it wasn’t true?” — quite profitably, it turns out. Althouse blog comments on this, noting Senator McCaskill’s statement “I know you feel that you’re a victim… If you would be more careful, maybe you wouldn’t be victimized as frequently,” which conflicts with “don’t you dare assign any responsibility to the victim!” arguments about female victims.